Why you should add guest blogging to your link building arsenal in 2010. I've heard that guest blogging may be a great "white hat" way to do some effective link building. Can you tell me more about this technique and provide me with tips on how to network with other guest bloggers in 2010? Answer: When it comes to ideal link building strategies, guest posting is just about as perfect as it gets. It's a free strategy that is beneficial to both you and the blog owner, it doesn't look suspicious to Google and best of all...it's completely free! Guest blogging is the process of creating a blog post specifically for another blog owner. Bloggers feature your posts on their blogs as a means of obtaining new quality content they themselves do not have to generate. In turn, you receive a byline and a nice link back to your own site. A guest post should be a piece of quality content that relates to your blog and the topic of the blog you are guest posting on. For best results, target a blog that is related closely to the subject of your own blog or promoted site. Doing so ensures your post serves their audience and brings new readers to your own blog in turn. 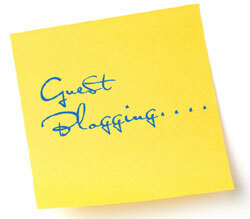 There are several noticeable benefits to be achieved from guest blogging. The first major benefit is links. You'll receive a valuable backlink from a closely related site and you may also generate links from other bloggers who blog about your guest post in the form of talkbacks or post rebuttals.